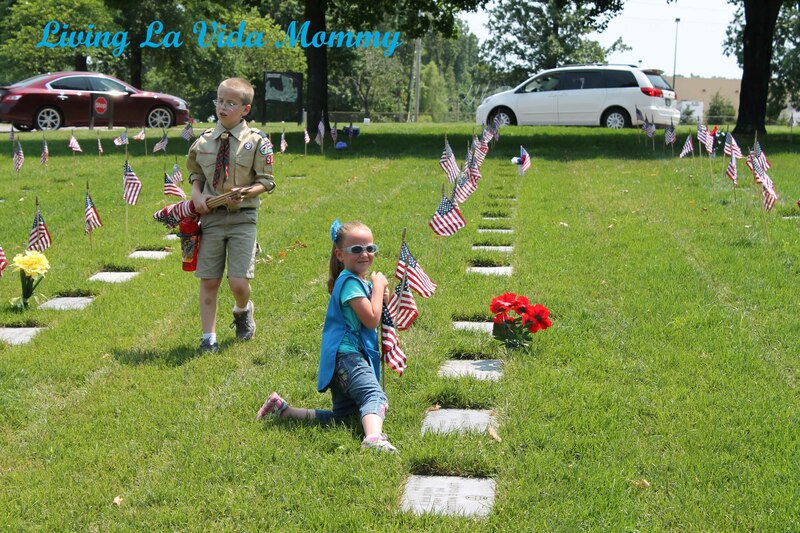 My scouts participated in the 63rd annual Memorial Day Good Turn at Jefferson Barracks Cemetery yesterday, and I could not have been more proud! This was Isabella’s first year going. And it was the year they almost didn’t get to go. At Matthew’s last pack meeting of the year, several weeks ago, there was a sign up sheet for attending the ceremony. Our family was the only one to sign up. Because of that, our pack was not going to participate this year. That made me sick. And sad. Very sad. After feeling helpless, I decided to stand up for what our family feels is right. I questioned the pack leaders and shamed them for letting a year go by where our pack isn’t represented in this very important ceremony. Sure, people like to celebrate the long weekend, but have they all forgotten why we celebrate Memorial day in the first place? It’s not the holiday of beer, hotdogs and float trips. It is a very important date to remember the brave men and women who have fought and who continue to fight for our freedom every single day. Attending the ceremony, honoring our fallen soldiers, remembering what they have sacrificed, well, I think that’s a little more important than getting drunk and eating BBQ. Well, as it turns out, one voice can make a difference. Our pack scrambled and got a handful of volunteers. Bella was able to attend and help put out the flags, something she has been excited to do since she first saw her brother do it years ago. That makes me so proud I could just burst! They braved the hot weather and relentless sun and they did something that mattered. And they still got hot dogs and BBQ. Win, win.